Poachers beware–the World Wildlife Fund is armed with GPS tracking devices and far-reaching plans to help tigers re-produce. The global tiger population has decreased from 100,000 to 3,200 in just a century, due to profit-seeking poachers as well as, in the case of Nepal, war-inflicted habitat destruction. “Therefore, habitat management is essential,” says Gurung. And the most important finding to come out of the study is that by preserving corridors that link breeding areas, tigers will more freely roam and breed. If, however, they are confined to small areas–and areas that are disconnected from each other–the population begins to decrease. Of course protecting those breeding grounds is also essential. 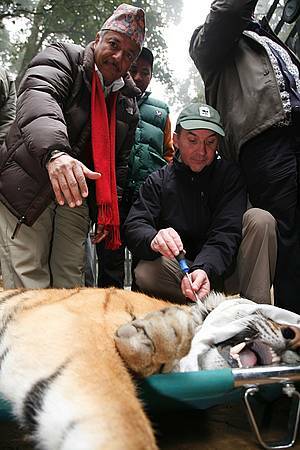 Poachers throughout Asia hunt in search of high profits from sales to China for use in traditional Chinese medicine.